Recently we were invited to review the Festive Menu for Carluccio's - a high street chain of family friendly Italian restaurants. It's no secret we love Italian food so when the opportunity arose to sample the Menu Festivo, we jumped at the chance - Jon & I are big fans of Carluccios and we always choose it whenever we have the chance to enjoy a date night together, in fact we have had a celebratory dinner there the night before each of the boys was born! We were given a very warm welcome upon arriving. 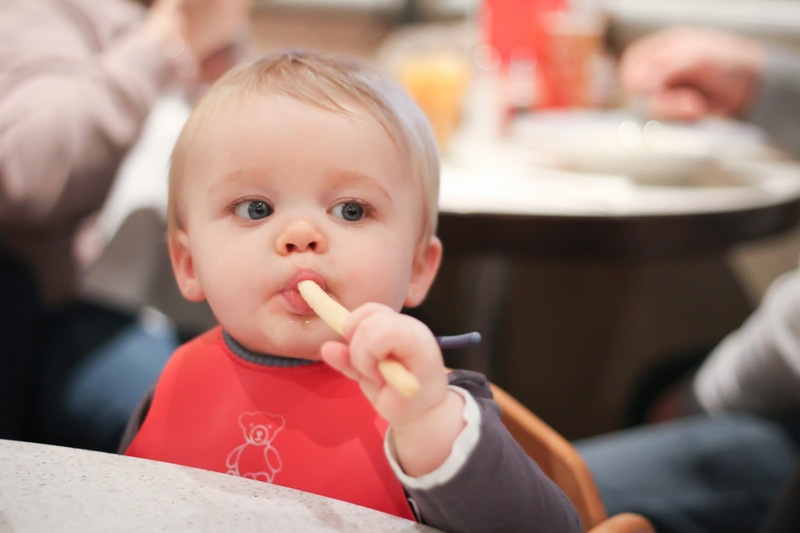 Now some restaurants may have been daunted by the arrival of a couple with two babies and a rowdy toddler during a busy period, but not Carluccios...the children were made to feel just as welcome as any other guest - Big thumbs up so far! The restaurant was spotlessly clean as was our table, and highchairs were provided for Noah and Sailor, our youngest children. Crayons and an activity book were immediately given to each child whilst the adult menu, Festivo Menu, and children's menu's were issued to ourselves. A great way to keep little ones occupied whilst the adults perused the dishes. 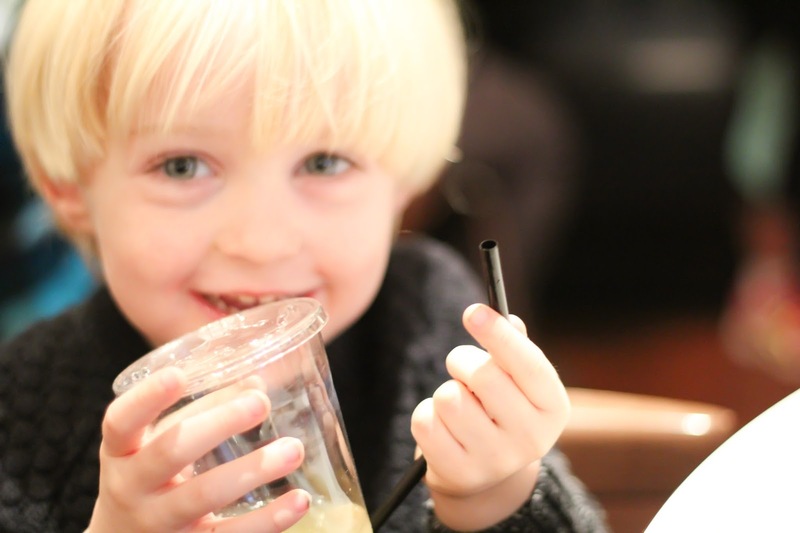 The childrens menu at Carluccios is really great and a big plus point is that the children are given Grissini (breadsticks!) to nibble on while they wait...any parent knows that snacks are the ideal way to keep children quiet so this was much appreciated! When our drinks were brought to us we noticed that all the childrens plastic cups had straws and lids. 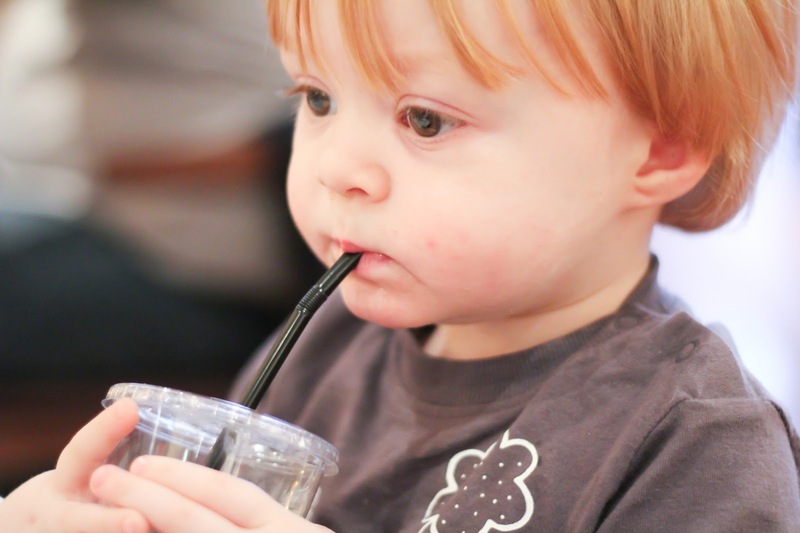 This is such a simple but effective idea for little ones and we were impressed with the thought that had gone in to it...so often we visit restaurants that claim to be child friendly but yet they don't provide the option for closed-top drinks or cartons for small children, which results in lots of spillages and monitoring for us during the meal - the simple addition of a lid and straws meant we didn't need to worry about accidents and allowed us to relax that little bit more...much appreciated! The children's menu contained some fabulous dishes and original, healthier ideas for childrens meals than you may usually find. 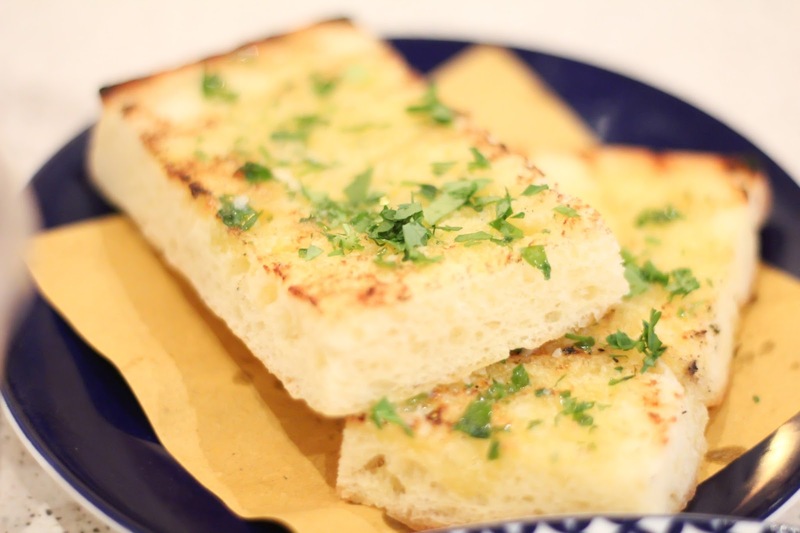 Starters consist of Grissini and a soft drink or the option of garlic bread for a small additional charge, whilst the childrens mains included Macaroni Cheese, Lasagne, Lemon Ravioli, make your own pasta combination and Chicken Milanese with ice cream or fruit sorbet for desserts. 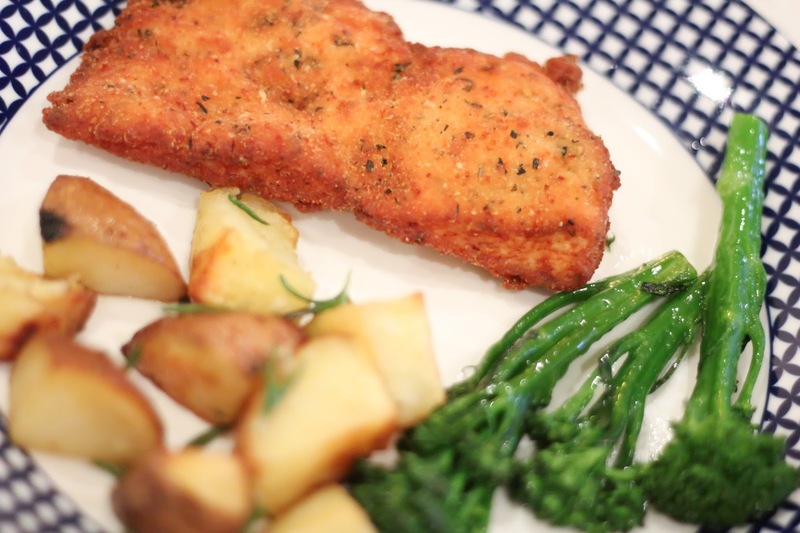 After a quick consultation both Tyne and Noah who both agreed upon the chicken which is breadcrumbed chicken breast served with potatoes and broccolini with garlic bread as a side order. Though spoiled for choice both Jon and I decided to stay with the spirit of the holiday season and ordered from the Menu Festivo. Once again there's a great choice of dishes and it was tough choosing what to have. 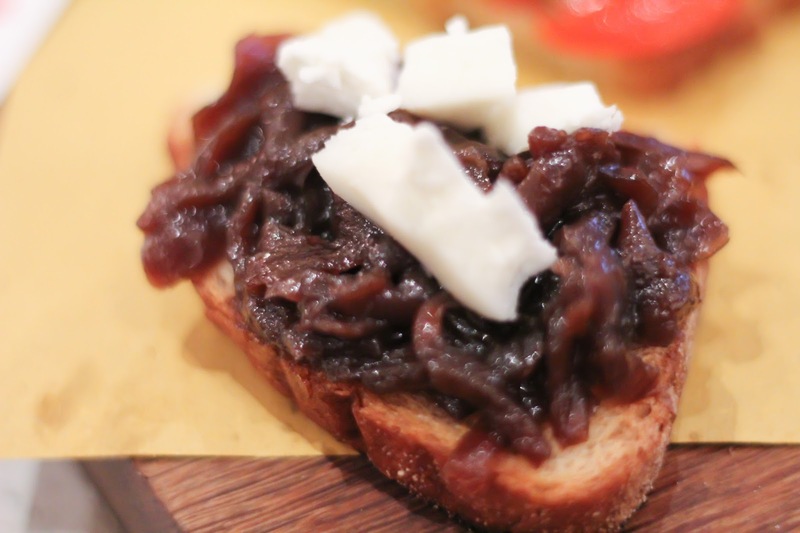 In the end I chose the Trio Of Crostini which was 3 different toppings served on toasted ciabatta with red onion jam for starters. For my main course I went with the Risotto Festivo (Mushroom and Baby Spinach Risotto with crushed toasted Walnuts, a Parmesan Wafer and a touch of Porcini oil). Jon chose the house Antipasti with marinated aubergines for starters and Seafood Linguine for main course. The linguine contained mussels, prawns chilli pasta and garlic. He's always been a seafood fan so was really looking forward to this meal. Our starters duly arrived and the children's meal were brought out at the same time. Again it seems obvious but this really shows consideration on the part of Carluccio's. I have to admit both Jon and I 'sampled' the childrens dishes whilst cutting up the food for them. We agreed that even as adults we would have been happy with the Milanese Chicken and Rosemary Potatoes. This made such a refreshing change from some restaurants whose children's menu consist of fish fingers and chips, sausages, or other kiddy food. The children both ate every bit of their dinner and Tyne particularly loved the broccolini...even asking for some of Noah's. This goes to show that other restaurants are getting it wrong by only offering children peas and sweetcorn with their main courses, it's extremely rare to see broccoli served with childrens dishes but Tyne just loves it. Our starters were - in a word - fabulous. Jon, who is normally totally averse to aubergine, stated he'd never had it taste as good before and would definitely be ordering it again. 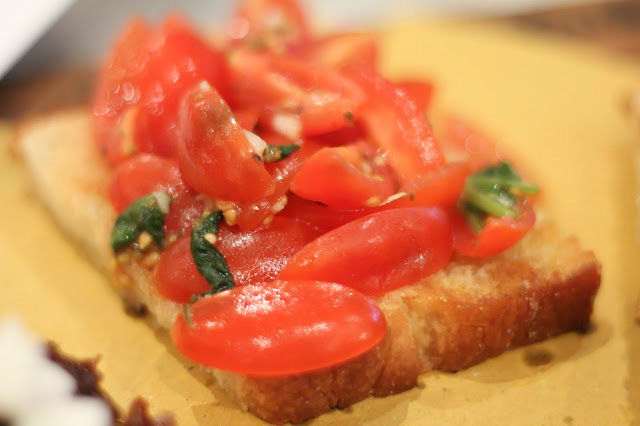 My ciabatta were delicious, the cherry tomato topping being my favourite - so fresh and flavourful. With our starters devoured, and the children thoroughly enjoying their meals, it was time for our main courses to arrive. 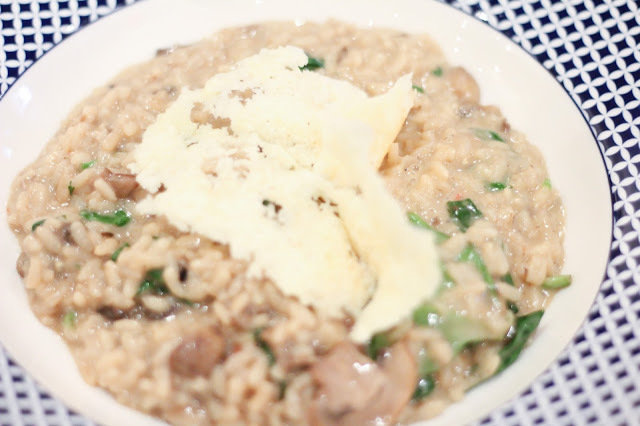 My risotto was served piping hot and was creamy, delicious and very satisfying on a colds winters day. In the past I have found that sometimes risotto can be a little underwhelming in the taste department but the mushrooms and walnut were a perfect combination with the parmesan crisp on top. The rice was exactly as it should be and not stodgy, sticky or too soft. 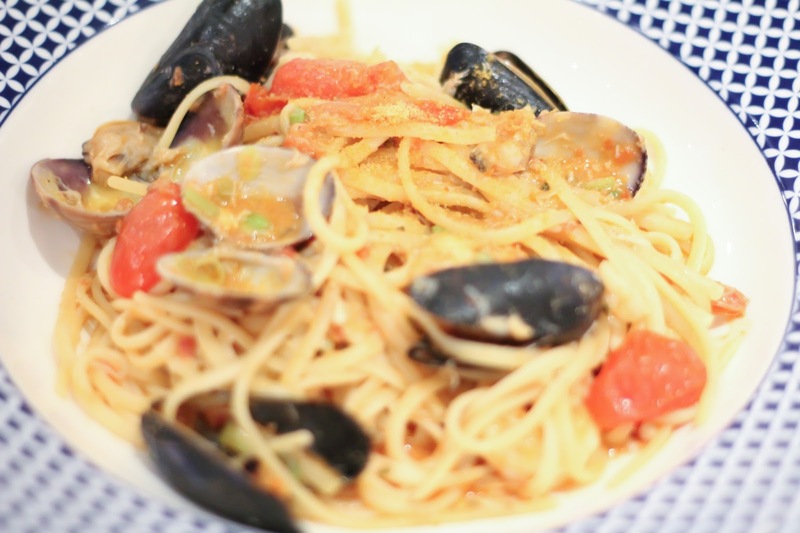 Whilst I am not a seafood fan, Jon's linguine smelled delicious and I could tell he was impressed as soon as it arrived. The pasta was cooked to perfection with just the right amount of chilli and garlic without smothering the flavours of the shellfish. After he had finished his linguine, Jon stated it was 'the best he had ever had'. This is quite an achievement as he tends to order this dish if on the menu in any restaurant. Another very happy diner Carluccio's! Having finished our mains and the children by now being very happy & well fed little campers, it was time for our desserts. After checking the dessert menu I chose Torta Al Cioccolato served with Raspberry Coulis with Jon choosing the Panettone with syrup and ice cream. The children both enjoyed strawberry gelato. Once again, the desserts did not disappoint. My torto was rich and chocolaty without being heavy. The Italian ice cream was smooth and tasted so fresh, the perfect accompaniment to the torta. 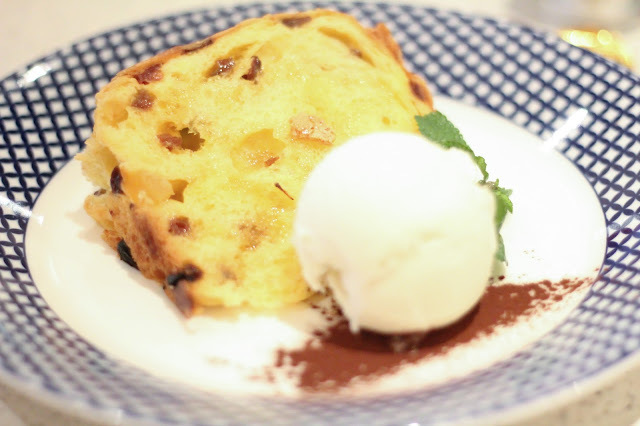 Jon said his Panettone was light and fruity and again served with vanilla ice cream. 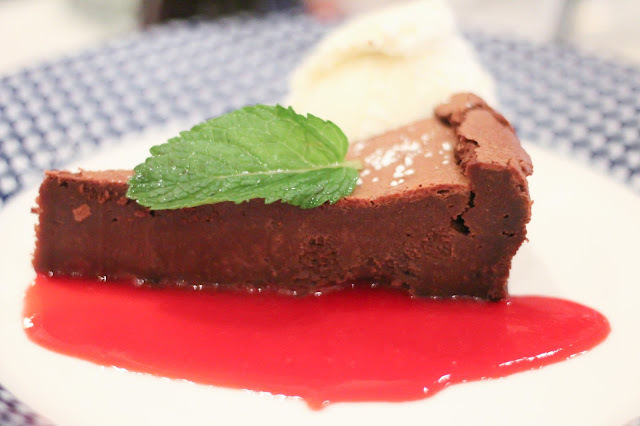 For each of us, the desserts were the perfect end to a really satisfying meal. From our arrival and throughout our dining experience the staff were attentive and made us all feel very welcome. The restaurant had a warm and friendly atmosphere and I feel this is largely down to the excellence and professionalism of the staff and the branch manager. It's a restaurant I know we'll be visiting again and again. 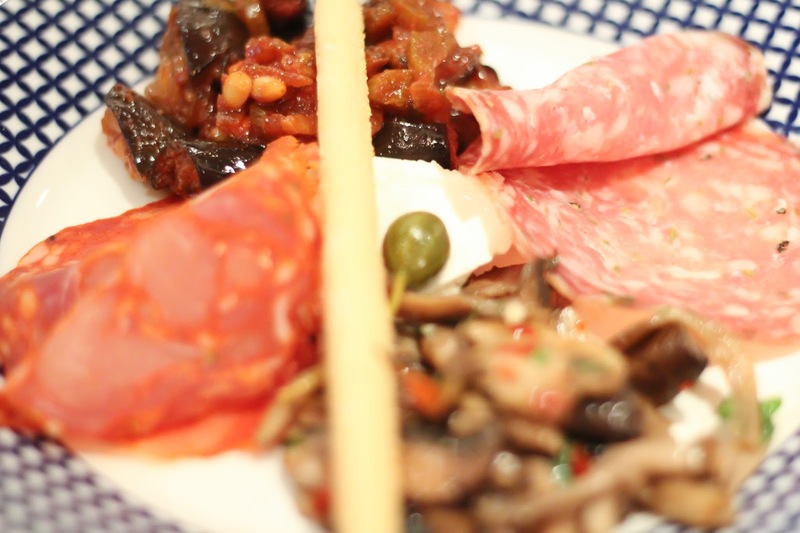 The restaurant which feature wifi and outside dining as well as disabled access, also includes a wonderful deli which boasts a host of Italian delights. I could spend hours (and a small fortune) on the choice of pastas, chocolates, and panettone alone. Once again, the deli area is spotless and in the same contemporary style as the restaurant with very friendly staff.